Ahsoka Tano is a Togruta from the planet Shili who was a Jedi Padawan during the Clone Wars. She was most known as Anakin Skywalker’s apprentice. She is known to be very determined and fearless when it comes to battle. However, she does have overly aggressive tendencies as well. This might have also been cultivated by the fact that Anakin also has a similar attitude. 1 Red Turtleneck Bodysuit Don’t worry if you can’t find a dress. You can use a red turtleneck bodysuit as your costume’s base. 2 Red Mini Pencil Skirt Pair your bodysuit with this simple red mini pencil skirt to achieve Ahsoka Tano’s tight dress look. 3 Gray Leather Leggings With a pair of scissors, carefully cut out triangular shapes at both sides of your leggings to get the exact Ahsoka Tano look down. 4 Red Leather Boots Ahsoka Tano prefers sturdy red leather boots when she’s out to battle. 5 Ahsoka’s Green Lightsaber A Jedi Padawan should always have her lightsaber handy. 6 Red Fingerless Long Gloves Protect your arms like Ahsoka Tano with a pair of red fingerless long gloves. 7 Red Leather Strips Use this red leather roll to create multiple arm bands and the crisscross belt that Ahsoka Tano wears. 8 Brass Buckle Use this buckle to finish your custom-made belt. 9 Red Handkerchief Ahsoka Tano’s belt has a red fabric hanging in front, and this red hanky can do the job perfectly for that. 10 White Face Paint Use white face paint to imitate Ahsoka Tano’s facial markings. 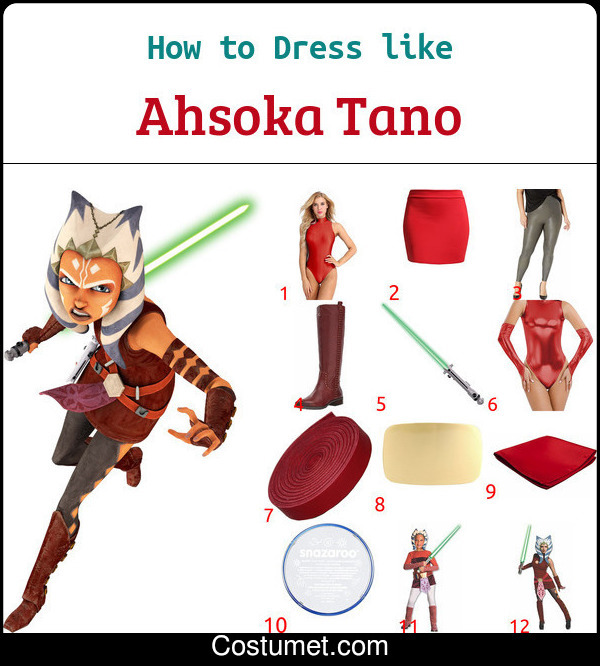 11 Girls Costume Set Transform your little girl into the fierce Ahsoka Tano with this costume set. 12 Full Costume Set If you don’t have a lot of time to DIY, you can always buy this costume. 1 White Fabric Cut out two pieces from white fabric and sew them together to form Ahsoka Tano’s hairpiece. 2 Light Blue Fabric Paint Use light blue fabric paint to create the blue markings in Ahsoka Tano’s headpiece. 3 Pillow Stuffing For a more realistic look, use pillow stuffing to create a 3D effect to your Ahsoka Tano headpiece. Ahsoka Tano was voiced by Ashley Eckstein for Star Wars: The Clone Wars. She is also the voice actor for characters like K2-B4, Aleena, and several more. Harley Quinn has wears a captioned raglan shirt, pink and red super short shorts, an awesome bomber jacket, and black fishnets. Base on her style in Batman & Robin movie, Poison Ivy has long bright red hair with bright green nails and green outfit.